Almost every part of Angkor Wat is emblazoned with intricate carvings steeped in Hindu and Buddhist mythology, from its meandering walkways to its tall doors, thick pillars and even ceilings. From murals depicting elaborate goddesses and monkey gods and demons waged in war, all riddled in the most convoluted detail, to towering sculptures like the symbolic Buddha naga (an enlightened Buddha is seated on the coils of a giant cobra), each and every stone carving has a fascinating story to tell of Cambodian history and legend. Engraved into every nook and cranny of the temple's rugged walls are bevies of bare-breasted dancing nymphs, heads enshrined with sophisticated headgear and bodies clad with only a limp sarong. "These are Apsaras," my guide Thoeun Bunthy tells me. In Hindu legend, Apsaras would gainly dance to music created by their husbands the Ghandarvas, who served as court musicians in the palace of gods. Over 1,800 stone carvings of these celestial and divine female beings line the exterior and interior of Angkor Wat, their arms contorted in an array of lithe positions that seem poised to break out into graceful dance. The long sandstone causeway that leads to the main temple is marked by prominent bleached and faded boulders. Weathered by rain and nature over the years, they barely show the original carving pattern of dragons inscribed, now reduced instead to a strange patchwork of barely there serpentine swirls and holes. Yet one can still faintly make out the unmistakable arch of a dragon's supple body, the warmth from the stone surface almost like the emission of fiery heat from the core of the creature's breath. And perhaps that is the beauty of stone carving: its impermanent ability in withstanding the relentless onslaught of time, encapsulating intangible history from a bygone era in hard, solid stone. Once a mark is made, it never, ever goes away. 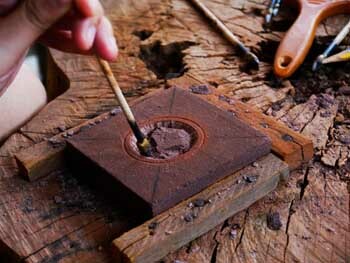 The art of stone carving has been around for time immemorial, having flourished since the foundation of the Khmer nation. Over 300 stone temples were constructed during the 9th and 12th centuries of the Khmer Empire - the golden age of stone carving - in the bustling metropolis of Angkor, with colossal sandstone blocks transported to temple sites by a series of long canals. But the decline of traditional and modern arts began later in the 20th century during the rule of the Khmer Rouge under leader Pol Pot from 1975 to 1979. An estimated 90 per cent of the population's skilled and educated artists were slaughtered in the process, whilst the remaining few survivors of the craft fled abroad. 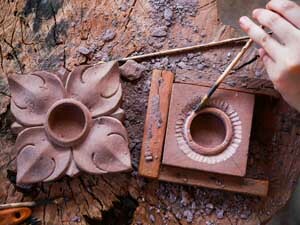 However, extensive efforts by the government, non-governmental organizations and social businesses has ensured the artistic revitalisation of the traditional Cambodian arts scene. Demand for stone sculptors and carvers has been brought about by the need to restore historical pieces in the temples, ensuring that these ancient skills continue to preside in the new generation. Along a dark and secluded corridor in a tower, a row of headless grey statues settle lonesomely on thick pedestals. With the jarring absence of their heads, they cast shadows against the walls forlornly as warm sunlight streaming in through the windows illuminates their nondescript pockmarked bodies. To the average tourist on first sight, these elusive statues bear little semblance of any individuality or identity, but I soon learn from Bunthy that they are Buddha sculptures which were beheaded during the Khmer Rouge. In 1979, the Khmer Rouge tried to completely obliterate Buddhism, killing monks, religious intellectuals and destroying Buddhist institutions. Any representations of the Buddha were desecrated; soldiers ravaged the vicinities of temples and cut off the heads of Buddha sculptures to sell them for money in the black market. "Too expensive to restore. They want to keep history," says Bunthy, pointing to a jagged indent left in the wake of a dismembered stone neck. With the revival of Buddhism in Cambodia over the years, now the official religion of the country, these preserved decapitated artefacts are the only potent vestige of Cambodia's previously tumultuous political landscape. Yet despite the deliberate acts of destruction they sit defiantly in the temple, their solid postures almost a taunt to their previous perpetrators who tried to rob them of their vivid existence. He manoeuvres the instrument with deft precision and ease, intensely scraping around the sides to even out the rough chip. Reminiscent of a skilled surgeon in an operating theatre, his level of focus is astounding, never once stopping to look up until the edge of the dint has been completely smoothed. "When I work, I don't see anyone who walks by. I see stone only," says Khet, who has been carving stone for 17 years. Immediately I think back to the myriad of chiselled bas-reliefs all over Angkor Wat. An immense admiration for the countless craftsmen who laboured over these carvings during the Khmer Empire washes over me. What little luxury they had falling into careless daydream, not when tasked with the pivotal responsibility of constructing the majestic architecture of Angkor with little room for mistake. The stone-carving business has been running in Khet's family for three generations - his grandparents and parents were in the stone-carving business, and Khet himself owns his own shop selling stone carvings. He tells me how as a teenager, he would spend hours after school every day honing his craft from his elder brother, a masterful stone carver. After so many years of being in the trade, it is still the immense pride for his country's architectural achievements that keeps his love for stone carving going. 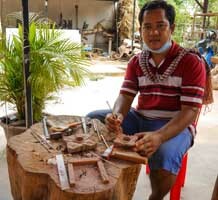 "It is my skill, and I want to continue the Khmer culture. Just like the people who make all the temples, I want to do the same thing as them," he says softly. After Angkor Wat I visit Bayon Temple in the late evening, renowned for its 216 charmingly smiling stone faces of the Bodhisattva Avalokiteshvara carved into every side of its 54 towers. Each massive face projects a serene display of absolute composure, as though nothing could possibly disrupt their sublimely tranquil state of being. "The gods smile for the people, so the people can live in peace and happiness," explains Bunthy, pointing towards the sky. I finally lay down my chisel after close to three hours of carving. A beautifully shaped Romdoul flower stone candle holder, with a small circular yellow lily candle placed in its hole, lies before me. "You okay?" Khet asks quizzingly, looking at my flushed face. "Hard work right?" Indeed. Fragments of stone and dust envelope the surface of the work table, like a mini excavation site. "But you do good, you faster than other tourists," he adds. I ask him how long it takes for him to carve the same flower from sandstone. "Too fast," he laughs sheepishly. "An hour and a half." For something which took a copious amount of effort and time, it is barely the size of my palm, measuring merely nine by nine centimetres. Yet what follows is an overwhelmingly indescribable feeling- almost surreal- as my fingers slowly close upon the now washed and polished stone flower, tracing every painstakingly carved defined contour, curve and swirl. It hits me then: I made this.